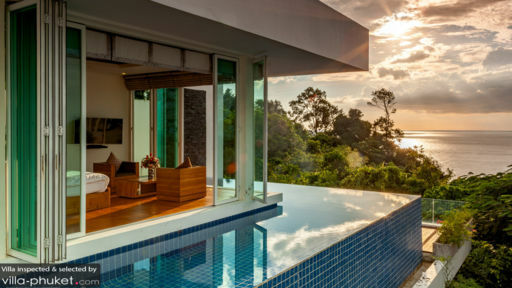 Perched atop the headland in the hills of Kamala Bay, Villa Solaris is part of the Amarin Estate and stands majestic against a view of the Andaman Sea and surrounding tropical jungles. Amid thickets of trees and verdant flora, the villa is breathtakingly luxurious and packed with activities for guests. Three swimming pools, a movie theatre, a gym and spa are just the tip of the iceberg. The four-bedroom retreat epitomises luxurious living at its finest with art deco interiors mingled with Asian tradition. Glass walls and doors allow an obstructed view of the azure seas and dense greenery throughout the day. While the sky is ridden with cotton candy clouds, enjoy a fine selection of freshly-grilled BBQ out on the terrace. Villa Solaris is anything but basic; it is a home that will surprise you at each turn. The four bedrooms are private, luxe, and extend spectacular views from their glass walls and doorways. The master bedroom is accessible via a land bridge and is more private, self-sufficient space featuring its own private lounge outdoors, L-shaped swimming pool, and terrace. The folding glass doors allow you to enjoy the fresh air even while relaxing on your king-sized bed. The other three bedrooms are equally well-designed with comfort as their top priority. From king beds to plush seating, the air-conditioned rooms are equipped to take care of their guests. The en-suite bathrooms are spacious with freestanding bathtubs, showers, and glass walls overlooking the mesmerising ocean. 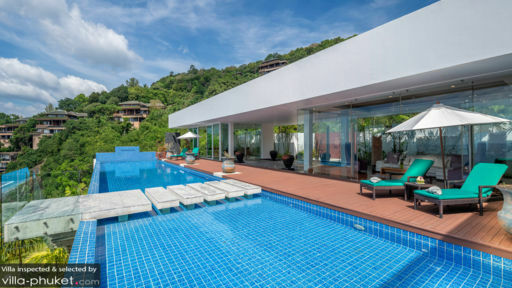 Made up of three individual pavilions comprising the bedrooms and living spaces, Villa Solaris in Phuket maximises on space by utilising it to its fullest capacity. Winding pathways, stepping stones, and a luscious landscape with water fountains all frame the gorgeous façade of this holiday home. The first of three refreshing swimming pools is an Olympic-sized, 25-metre beauty overlooking the ocean. The second is an L-shaped swimming pool that wraps around the master bedroom giving the luxury of a private pool to guests of the room. The third and final pool is a good 18-metre in length and is located adjacent to the sun terrace equipped with outdoor dining and BBQ. While guests are free to chill on the rooftop terrace lounge where you can catch spellbinding sunsets each evening, the main living pavilions are awash with natural light, the tropical breeze, and comfortable interiors. The floor-to-ceiling glass walls ensure you’re always connected to nature. Designed with a flair for vibrant colours and edgy décor, the living area will soon become your hub where everyone can congregate for some memorable times. The home theatre is furnished with leather recliner chairs and a large screen with a fine movie collection giving way to what would surely be an endless movie marathon. You are free to dine wherever you wish, be it indoors or outdoors. Request the staff to wow you with delicious food made with all fresh and locally-sourced ingredients prepared in the villa’s kitchen. You can entertain guests with evening cocktails and the gorgeous sunsets with this indoor-outdoor setting. Villa Solaris is fully-staffed with trained and skilled professionals to make sure the house runs smoothly and the guests are satisfied. The villa is equipped with more than the regular services such as a multi-purpose gym and spa for all your fitness and wellness needs. The gym is equipped with a treadmill and other exercise equipment while a massage or therapy at the spa will leave you feeling like melted butter. 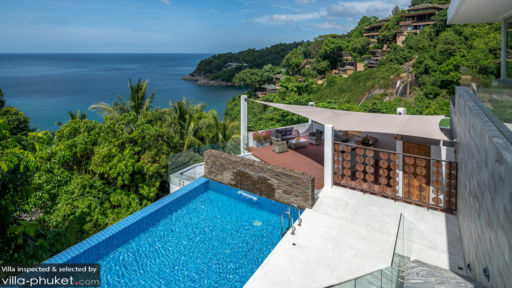 Found as one of the many exclusive rentals on Kamala Bay’s “Millionaire’s Mile” , Villa Solaris is ideally located only minutes away from the beach. Head down to its white sandy shores for a day of sunbathing and idle relaxation. There are some nice restaurants in the area as well serving up the catch of the day or western dishes. Beach clubs are a great way to unwind after a long day for which you have Café Del Mar and HQ Beach Lounge.